How can we educate, employ and retrain citizens for the new skills economy? A quantum of change is coming. As the age of automation takes hold, both young people entering the workforce and those already established in their careers are fretting about the rise of the machines. But while machines will be increasingly powerful, humans will actually be more essential. This is the clear message I’ve heard when speaking with clients across Canada, the United States and abroad. Notwithstanding the market volatility of recent months, from dairy farmers to oil companies to tech firms, business leaders and entrepreneurs are struggling with an enormous labour shortage. Within our own business, we’re increasingly looking to bring new skills into the Royal Bank of Canada (RBC) in areas you might expect, like machine learning and blockchain, but also in areas you might not, like designers and behavioural economists. We view this secular change as a chance to redesign the bank from the customer in. It’s clear that technology will not be a replacement for many of the skills needed for the jobs of the future. It will simply act as a supporter and integrator – making digital fluency just as important as literacy and numeracy in the future. 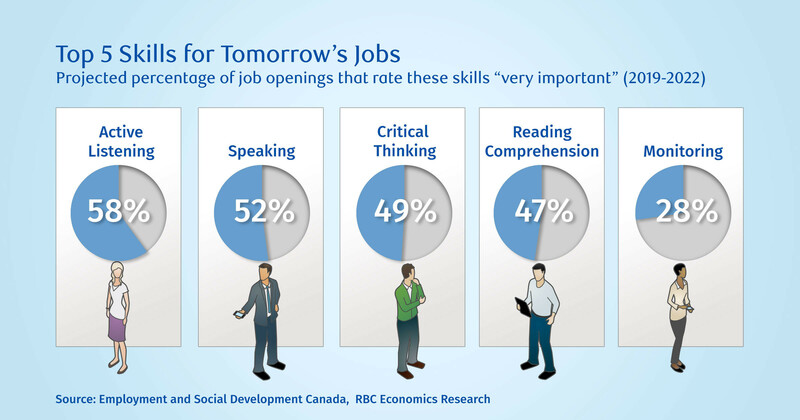 And this was a key finding in a recent RBC report on the Canadian labour market called Humans Wanted, which examined more than 300 occupations and the skills needed to do them. While the report concluded that half of all jobs in Canada are at risk of a significant disruption by technology during the 2020s, it also suggested that the age of automation doesn’t have to be a threat. Despite the disruption, it is predicted that 2.5 million jobs will be created or become open in the Canadian economy over the next four years, a significant figure for a nation with 18.5 million jobs today. This workforce is going to need foundational skills to prepare them for several different jobs and roles, as opposed to a single career path. This is setting up a quiet crisis across Canada – and virtually every nation around the globe – with future, young and established workers feeling unprepared for what the jobs of the future will look like, let alone the skills needed to do them. The reality is the children of today will grow up to work in tech-enabled jobs that very likely don’t even exist yet. To plan for that reality, it’s not just about coding, it’s about being human and acquiring competencies that offer more skills mobility, such as critical thinking, creativity, communication and complex problem-solving. The Humans Wanted report clearly showed skills mobility will be essential in a future economy where jobs rise and fall with each new technology wave. But how can private sector leaders, educators and policy-makers go about changing the way we educate, employ and retrain citizens to empower them in this new skills economy? While the pace of disruption continues to increase, baby boomers are also inching closer to retirement. This puts the pressure on the next generation of youth who are looking to acquire the mix of skills they’ll need to thrive in the new world of work. To foster these skills, we need to better connect post-secondary campuses and workplaces through paid work-integrated learning programmes such as co-ops, apprenticeships and internships. Every post-secondary student should have access to meaningful, hands-on work experience related to their field of study by the time they graduate. The post-secondary model that thrived throughout the 20th century is no longer adaptable to the new needs of countries, companies and communities. We need to train youth in different ways, in addition to building infrastructure that will help support retraining and lifelong learning efforts for the existing workforce. To ensure work-integrated learning programmes become ubiquitous, governments of all levels should work together and fund initiatives that make it easier for employers and education institutions to participate. Nations need to approach this challenge from a new perspective. Instead of looking at a talent pipeline, they should shift toward building a talent platform – one that better connects businesses with students across every sector and discipline. To help put this into action, governments need to decide what they want to focus on and where they want talent and capital to flow toward. This means making skills and youth central to a nation’s big bets. For example, in Canada, that’s on agriculture, oceans, data, artificial intelligence and advanced manufacturing. Lastly, employers of all sizes must start to recognize the shift from the jobs economy to the skills economy. We need to rethink the way we hire, retrain and shape our workforces – and that requires thinking beyond degrees and certificates. Finding and retaining talent consistently ranks as the top priority for global CEOs. It should be a business imperative to better integrate with educators and offer more experiential work and learning opportunities for students. This isn’t about simply providing young people with work placements, but rather it’s about harnessing their talents and tapping into their innovative ideas. As an example, last summer, students who took part in our RBC Amplify programme – a campaign where we give co-op students some of our toughest business problems to solve – collaborated to file 15 patents for the bank. They worked on projects to improve our predictive analytics capabilities, data management policies and cybersecurity measures. None of these students had ever worked in a bank before. All employers need to view work-integrated learning as not only an investment in the skills economy of tomorrow, but also as an investment in their own future. The bottom line is: jobs will remain, but they will require a whole new set of skills to do them. New technologies will make some jobs obsolete; however, they will also reduce costs and drive expansions that will lead to employment growth in new areas. The answer to technology disruption lies in our ability to apply humanity to the challenge. Over the next decade, our world will be tasked with solving some of the most pressing issues it has ever faced, including climate change, wealth gaps and health costs in rapidly ageing societies. It is only through building a strong foundation for the new skills economy – investing in our youth and supporting lifelong learning programmes for our existing talented workforces – that we can ensure our nations and people are ready to take on a turbulent tomorrow.